Nairo Quintana (Movistar) leaves the Route du Sud with another win in his pocket, and his confidence flying sky high. 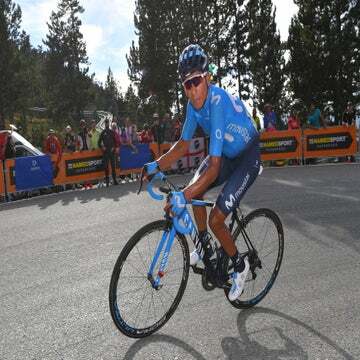 With the Tour de France getting underway in less than two weeks, the Colombian climber put the finishing touches on his form with a time trial stage win and overall victory during the four-day Route du Sud. Arnaud Démare (FDJ) won a bunch kick Sunday, and Quintana coasted across the line to secure his third stage-race victory this season. Any doubts that Quintana would be ready for the Tour were erased during the four-day race in southern France. He attacked on the opening day to stretch his legs, and then won a time trial stage against French rider Sylvain Chavanel (Direct Energie), and was so strong in Saturday’s queen stage he could let Movistar teammate Marc Soler attack to take the stage win. Granted, the competition was hardly what the rest of the Tour favorites faced at the Critérium du Dauphiné or Tour de Suisse, but Quintana was sure he made the right choice to race the Route du Sud instead. It was an ideal, low-stress re-entry into the European peloton. Quintana unveiled a new time trial bike, and was able to race without too much stress ahead of the Tour. Soler was second overall at 36 seconds back, while Nicolas Edet of Cofidis took the final podium spot as Hugh Carthy (Caja Rural) crashed late in Sunday’s stage to drop from third to 22nd. Quintana takes queen stage at Colombia; Lopez secures overall.